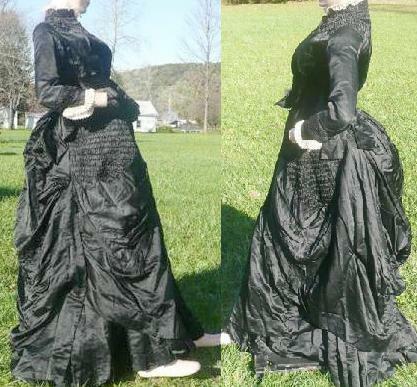 This auction is for a stunning original 1870S - 1880s Victorian woman's two piece gown. Created with soft luxurious solid black satin fabric, gads of jet black glass beads and lovely lace. All this in very very good condition. The silk lined 9 stayed Bodice is designed with a high 1.5" wide mandarin collar that is completely adorned with the beading and 1.5" wide tiny polka dot scalloped lace ; the shoulders are completely covered with smocking / ruching, 13/14 matching fabric covered buttons, on each side of the waist is a 1" x 1" tightly smocked area that creates a pleating downward to the waistline - all this is covered up with a multi tucked cummerbund style belt that has a large dangling bow. 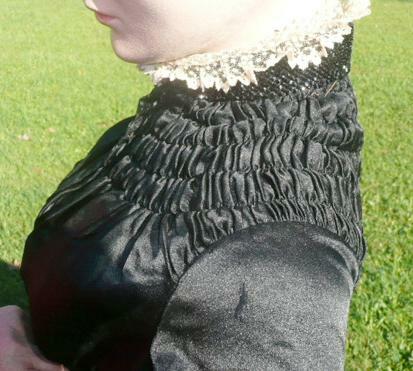 The back of the bodice has more smocking at the nipped waist, the tails have weighted buttons. The full length sleeves are also as lovely as the front and back of the bodice, the 2.5" cuffs are trimmed with more beading and tucks surrounding the cuff, all finished with a V point trimmed with more lace. 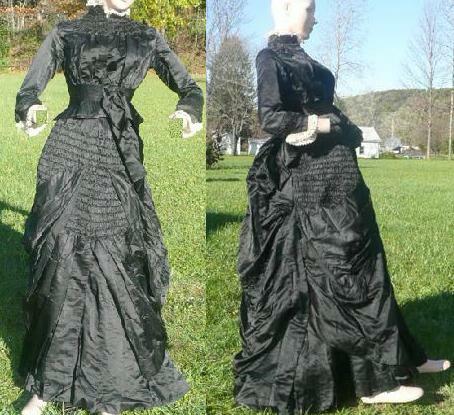 The skirt is, as if not more stunning than the bodice; the front waist to middle is completely covered with more wide smocking; centered between the smocking with a panel/overskirt that is draped to a pointed V flowing toward the right side. 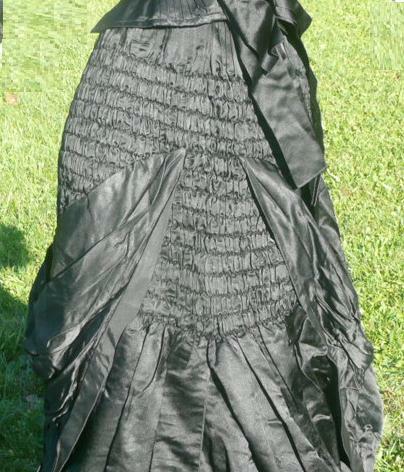 The center of the smocking on the left side is split / divided and now an overskirt wraps around to each side and all this is on top of a very heavy wide pleated underskirt. The back is a bunted and bustled with a superb billowing effect, this again is an overskirt to the same heavier skirt as in the front. All this is accented to give a wide and deep bustled effect because of the construction inside, two 1/2" x 15" brown chintz fabric covered very metal stays are sewn into the back and an attached 8" x 7" silk thick padded bustle . 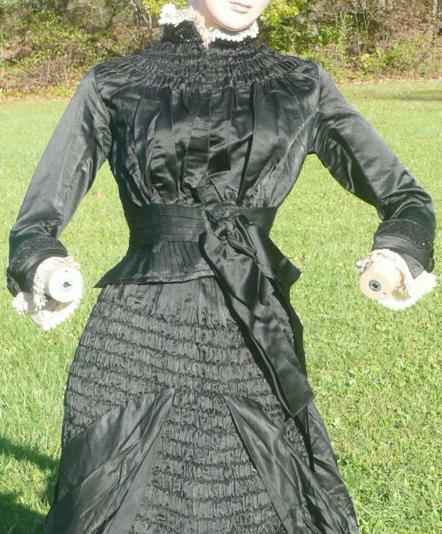 This very detailed construction could only have been done by a very experienced seamstress. There is a name stamped on the waistcinch, unfortunetely some of it is faded. Measurements are taken laying flat, closed and across; Bodice - 32" bust, 23" waist, mid shoulder to waist hem 16"; Skirt - 24" waist, 42" front top of waistband to hem and 44" top waistband to back hem. In overall very good very sound very clean condition; underneath at the metal stays there is some wear of the inner fabric and as with most the waistband will need some minimal repair. 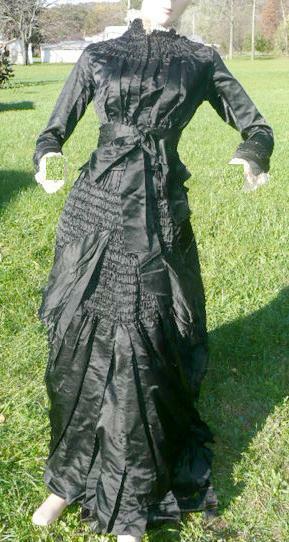 Some of the stays in the bodice are missing. 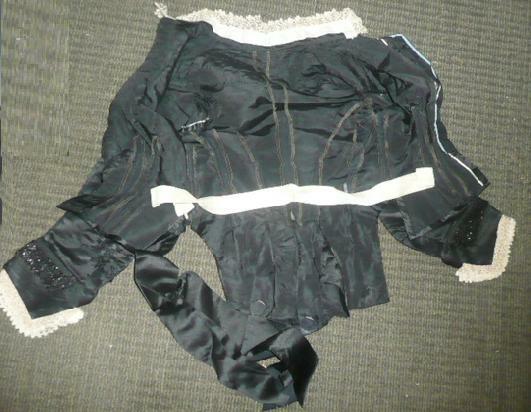 Overall this truly is in fabulous condition, it is quite clear that is was not worn probably more than one to two times - there is not any underarm marks and only extremely mimimal wear on the hems. 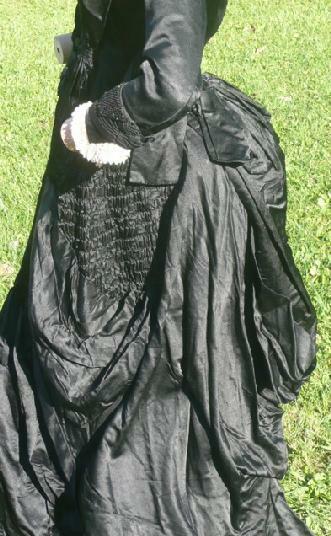 This is one of the loveliest mourning gowns I have owned in the past 30yrs of collecting. Of course, it could have only been owned by a woman wealth. Also, because of the opulence it is probably safe to assume it was for recieving guests or a special occasion where she would have still wanted to make an eye catching appearance, an exceptional gown!!! Happy bidding or why wait, BUY NOW!